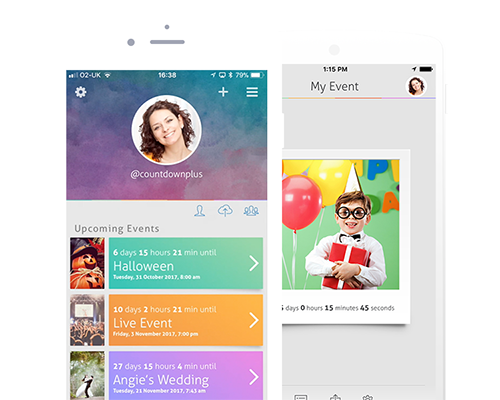 Countdown+ (also known as CountdownPlus) helps you keep track of important events in your life such as birthdays, weddings, holidays. 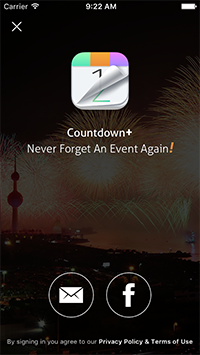 From smart reminders that remind you closer to an event, to multiple event sources, Countdown+ ensures that you'll Never Forget An Event Again! Countdown+ also includes user accounts which expand our features beyond any other countdown apps on the App Store. We believe that keeping track of important events in your life is an experience to be shared. You can setup an account by logging in via Facebook or signing up with an email address. Your events are synced to all your devices including your Android devices and the on the web. You control your event visibility, so private events can only be viewed by you. Backup your events to prevent data loss. Your countdowns are saved to our servers and can be restored in case you lose your device or perform a factory reset. 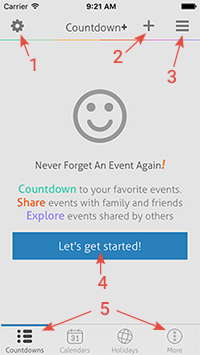 When sharing your events, you get an event code and a URL link that allows other users to join the live count of your event. Changes you make are automatically propagated to all users who joined your event. Follow your friends and get notified of any public events that they share. This sounds like a restore prior purchases issue. Check out this tutorial on how to fix the issue. We now have our own cloud based system, so when you want to move to a new phone then you will be able to load your countdowns just by logging in via email or Facebook. This feature only works on the full version of the app. What can I expect on the Full Version? You can expect to see a few exciting features on the full version of the app, to find out more watch this tutorial. What’s new with the image packs? Has the Facebook tab been fixed? Yes it is and here is tutorial to show where the option has moved to. Can I share to Facebook now? Yes with Version 4.0 we have fixed the minor bug to post to Facebook. Don’t forget to use the #countdownplus on all the social channels.